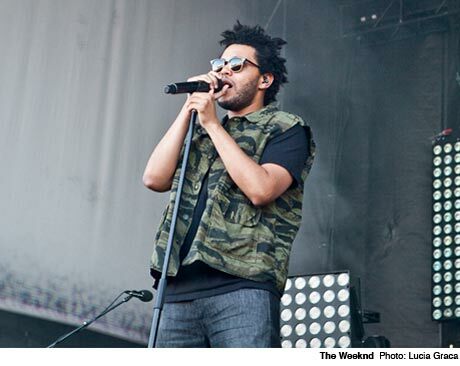 After making a massive splash last year with three buzzed-about mixtapes, R&B crooner the Weeknd has played some high-profile shows so far in 2012. This fall, the Toronto-based artist also known as Abel Tesfaye will keep the momentum going with a new tour that includes gigs in some impressively large venues. In September and October, the Weeknd will hit the road for some U.S. shows with Florence and the Machine. However, these dates will be broken up with some Canadian headlining shows in Winnipeg, Edmonton, Calgary, Vancouver and Montreal, as well as a few more south of the border. Check out the newly revealed schedule below. Our recent Osheaga review noted that Tesfaye is good at commanding the attention of a sizable venue, which bodes well for this outing. UPDATE: The Weeknd will also be playing Toronto on November 2 and 3.